As one of the city’s most versatile hotels, Mercure Bangkok Sukhumvit 11 is home to an array of modern facilities and amenities in addition to its 232 stylish guestrooms and suites. Some examples include a rooftop swimming pool, a wide-range of dining outlets catering to diverse cuisine such as Mediterranean and Argentinian, and a fully-fitted wellness centre. Moreover, as an esteemed member of the celebrated Accor Hotels Company, Mercure guests also have full access to the spa facilities at Le SPA with L’Occitane, nestled within five-star sister property Sofitel Bangkok Sukhumvit. 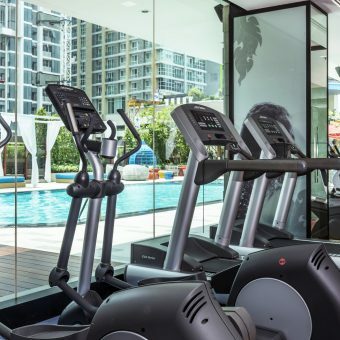 Mercure Bangkok’s state-of-the-art fitness centre sits adjacent to the swimming pool and terrace on the fourth floor. Its interiors and overall ambience are modern and sophisticated, reflecting the hotel’s ethos and approach to design. As one of the best gyms in Bangkok Sukhumvit, the centre offers all the equipment necessary to maintain a wholesome fitness regime including cardio, strength and endurance training equipment, such as elliptical machines, treadmills, stationary bikes and free weights. Moreover, as the gym is open daily from 6am till 10pm, there is plenty of time to fit in a workout in-between a busy schedule visiting all of the city’s most unique sights. Additionally, unlike other options, this gym Sukhumvit situated transports you away from all the hustle and bustle of the buzzing metropolis into a calm and tranquil oasis. Its close proximity to the outdoor swimming pool allows for views of its inviting crystal blue waters that are perfect for an after exercise dip or a few relaxing laps. The surrounding lush gardens and foliage that make up the terrace area also provide a fitting location for outdoor activities like yoga or circuit training, or to amp things up a bit, invite your friends to take part in a group fitness session. So whether you’re starting the day off on the right foot or winding down after a long outing spent exploring the city, Mercure hotel’s fitness centre is equipped for all needs. In addition, for an indulgent treat to soothe all sore muscles, make sure to pay a visit to Sofitel Bangkok Sukhumvit’s Le SPA with L’Occitane which is the top luxury spa Bangkok has to offer. The wellness centre is urban in its design but incorporates ancient healing traditions into its treatments, curating a menu of specialised and rejuvenating therapies. And if you needed more reasons to fall in love with the esteemed establishment, each treatment uses the highest quality products from celebrated French lifestyle brand L’Occitane, which has led to its win in the category of ‘Best Luxury Hotel Spa in Thailand’ at the prestigious World Luxury Spa Awards 2016/2017. Furthermore, many of the spa’s signature and traditional treatments are available as part of a spa promotion, wherein visitors can benefit from more affordable prices. Some favourites among guests include the Immortelle Secret to Brightness, which is formed around the latest in French-inspired cosmetology practices. Or, if you’re a frequent gym user or avid athlete, opt for the traditional Golden Siamese Massage that is designed to sooth aches and pains while relieving muscle tension. The popular Four Teas Ceremony is a spiritual experience that focuses on exfoliating and brightening the skin at the hands of one of the spa’s many talented and experienced Thai therapists. Or, for visitors looking to experience a traditional Thai massage, many varieties are also available to choose from—including deep tissue to reflexology styles. The diversity in treatments available combined with the professionalism and high standard of staff is what makes Mercure Bangkok, and our sister property Sofitel Bangkok Sukhumvit, undoubtedly the best spa hotel in Bangkok. Fitness Day Pass: THB 500 NET!